Indian skipper Virat Kohli won the toss and elected to bowl first. After losing the first T20I against Australia by 4 runs in Brisbane, India will look to up the ante and as the second T20I is important for India to win. 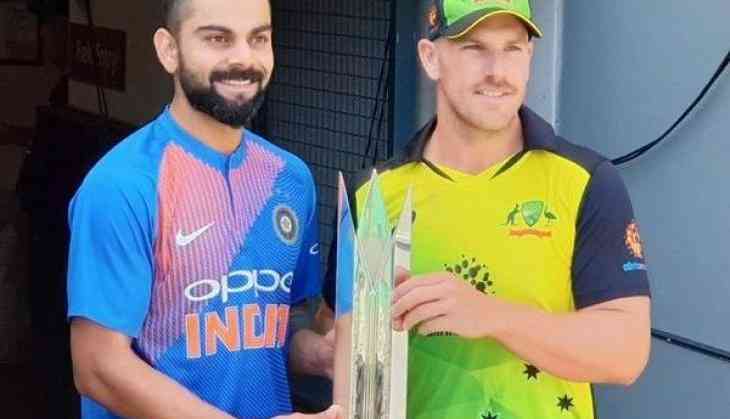 Aaron Finch led Australia is leading the series by 1-0 and if Virat Kohli led India lose today's match the series will go into Australia's pocket. The first T20I played in Brisbane was the first T20 international that India lost in 2018. The second T20I will be played at Melbourne Cricket Ground (MCG) and the match will start at 1:30 pm IST. India: Virat Kohli(c), Rohit Sharma(vc), Shikhar Dhawan, KL Rahul, Rishabh Pant(wk), Dinesh Karthik, Krunal Pandya, Bhuveneshwar Kumar, Khaleel Ahmed, Kuldeep Yadav, Jasprit Bumrah. READ NEXT >> India Skills Report 2019: Guess which state topped the employability rate list?